Why did it take so long to realize this? The true heroes, the honoured and adored subjects of countless classical works, are not obscure distant lovers, landscapes or heroic ideals - no, our animal friends are what inspired the great masters! Nikolai Rimsky-Korsakov devoted his most popular piece (also one of the most famous classical works ever) to a bumblebee, Bach wrote Sheep May Safely Graze, Camille Saint-Sa�ns created an entire imaginary musical zoo in his famous Carnival of the Animals, Jacques Ibert composed a monument to a donkey. We can thank the Salut Salon ensemble, along with many others, for exploring this zoological side of music. For their new album, "Carnival Fantasy", the four exceptional musicians have taken their successful stage program into the studio. Like no other chamber music group, these four ladies from Germany have inspired fans around the world for the past 13 years with virtuoso playfulness, charm and humour that transcend the boundaries of genre and ventures off the beaten path of traditional classical music. 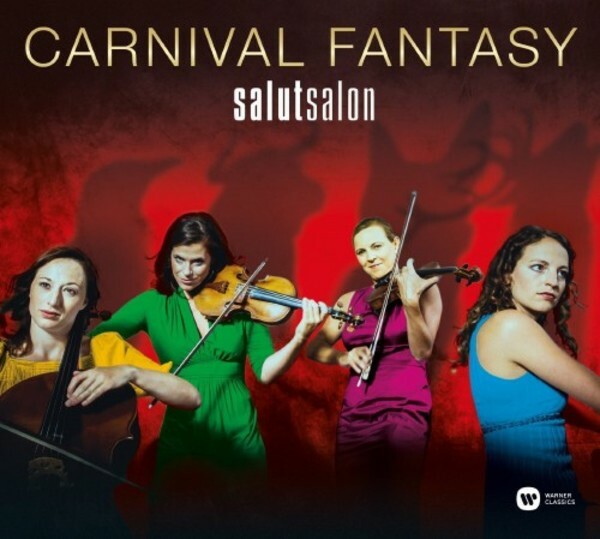 "Carnival Fantasy" is a firework of transformation, a playground for boundless joy and a celebration of unique, surprising arrangements - a trademark of the quartet. We experience Saint-Sa�ns' famous "Swan" as a moving solo on the singing saw. With a quirky version of the song "Trust in me", the tune the hypnotic snake Kaa sings in Disney's Jungle Book, the phrase "classic seduction" takes on a whole new meaning. Fish, Bach's sheep, even fossils and a luminescent jellyfish (who has a delightful love song dedicated to it!) find their place in the program. A sophisticated culinary lion educates us about breakfast in the savannah. The delight of transformation is the underlying theme throughout the album. Just like at the carnival, where the world is turned upside-down for a moment and nothing is as it appears. Klaus Doldinger's "Boot" meets Kurt Weill's "Mack the Knife" and Astor Piazzolla�s "Escualo" meets John Williams� "Jaws". The boundary between humans and animals is blurred to the point that you may even discover that many a character from the animal world can be found right next door ... Welcome to the realm of fantasy! The album with Angelika Bachmann (violin), Iris Siegfried (violin and vocals), Sonja Lena Schmid (cello) and Anne-Monika von Twardowski (piano) will appear as a limited deluxe edition with an exclusive bonus DVD.